A tooth extraction isn’t just yank and all done. It’s a surgical procedure. Sometimes it’s relatively simple and straightforward; others, it’s more complex. In all cases, and like any dental or medical treatment, it involves risks. Last week, we mentioned an all too common one: the development of “cavitations.” But although it’s common, this condition isn’t exactly well-known. So let’s take a closer look. In simplest terms, a cavitation is a hole in your jawbone. Within is dead, decaying tissue. A more accurate term for it, then, is jawbone osteonecrosis. “Osteo” means bone. 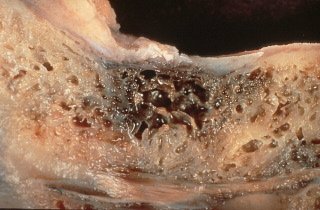 “Necrosis” means the death of cells or tissues through injury or disease. You know that can’t be good. In 1996, Hal Huggins and Thomas Levy found that cavitations occur in 77% of all extraction sites. Nearly 90% of all wisdom tooth extraction sites they looked at had cavitations. Sites in the front of the mouth were found to be affected, as well, but less so than those in the back. A more recent study in Clinical Oral Investigations found that 32% of all cases of jawbone osteonecrosis were caused by oral surgeries. So what is it about surgery that makes cavitations so “routine,” as Huggins and Levy put it? The first thing to keep in mind that not only does the whole tooth need to be removed – not leaving any root tips behind – but also the periodontal ligament. This bit of tissue attaches the tooth to the bone in which it sits. The bony surface just below it must be cleaned, as well. the surrounding bone receives no notification that the tooth is gone. The continued presence of any portion of the ligament gives the biological message to the surrounding jawbone that all is well and no new bone growth is needed. Meantime, the tooth remains connected to the body’s blood flow, which can become a kind of infection expressway. For another thing to keep in mind is that, with the general exception of the wisdom teeth, an adult tooth is usually extracted because of disease. It could be a case of deep decay or an infected root canal tooth. Very often, periodontal (gum) disease has resulted in so much bone loss that teeth come loose. In any case, simply removing the tooth doesn’t entirely address the infection. At most, it removes a key part of the cause. Any lingering pathogens effectively become sealed under the new tissue that grows over the surgical site. There, they are free to colonize and multiply. These microbes and their metabolic byproducts become a toxic burden on the body. Often, people are unaware that they have jawbone osteonecrosis until they develop chronic, systemic health issues. Research published in the International Journal of General Medicine suggests that cavitations may, in fact, serve as “a fundamental cause” of inflammatory diseases. Previous studies have certainly linked them to many specific conditions in which inflammation plays a major role. These include cancer, Alzheimer’s, Parkinson’s, chronic fatigue (CFS), multiple chemical sensitivity (MCS), fibromyalgia, multiple sclerosis (MS), Lou Gehrig disease (ALS) and lupus. Fortunately, cavitations are readily treatable through reopening and thoroughly cleaning and disinfecting the old surgical site, often with ozone. Supportive therapies from allied physicians can help the rest of the body heal from that original insult and related conditions. If you’re faced with a situation that requires the removal of a tooth, remember to follow the biological approach. Explain your concerns about cavitations. Ask your dentist to “carefully and thoroughly” remove the periodontal ligament. Hopefully they’ll follow your instructions. If not, you might want to find a biological dentist who understands the importance of this simple yet critical step. It’s your mouth and it’s your health that’s at stake. Being an educated patient now may prevent you from experiencing years of unexplained pain, discomfort or compromised health conditions later in life. Are cavitations a concern with the extraction of baby teeth also? Infection that may lead to cavitations in an adult aren’t addressed the same way in a child, out of concern for the adult teeth below the primary teeth. If the baby tooth is deeply infected, the extraction site may be treated with things like ozone so as to address the infection without risking injury to the erupting tooth below.